Do you need a tilt/shift lens? I’ve spent a fair amount of time pondering this particular question and wondering if I should spend some of my loot on such a pricey item. I thought in this post I’d explore the alternatives to, and virtues of these lenses. For some 5 years of my photo career, a monorail view camera was my most used piece of kit and I’ve also used my Cambo monorail in recent years on a project called ‘Acres of Value’. There’s nothing quite like working with view cameras, process can be important and is definitely revealed when using these heavy, slow and expensive to shoot tools. For the architectural photog who does a ton of exterior elevations, tilt/shift lenses are undoubtedly a worthwhile addition to a camera bag. Anyone who photographs real estate - likewise. If you're trying to sell property, the worst angle to be shooting certain interiors from is the vertical midpoint of the room. You need to be fairly high up with a little bit of drop front/shift so that kitchen worktops and flashy expensive bathroom suites can be clearly seen. For the rest of us however, who might only occasionally need to correct convergence/divergence there are alternatives. I’ll start with resolving the problem when creating an image, i.e. standing in front of your subject with your camera in hand. The first question is - do I have to shoot this building from ground level? Can you, for example, gain height from an adjacent building or can you and your camera be physically elevated to prevent convergence of a building exterior? Obviously, this technique won’t be easy with a skyscraper but for a lot of buildings, it's worth considering. If you’ve been commissioned to photograph completed works then there’s a very good chance a cherry picker will be on site. Every building owner/project manager I've ever met has been more than happy to accommodate the request to borrow the picker and operator for a short while. The other major advantage of getting up high is that you get a completely unique view, which can help your work stand out from that of other photographers. In this wonderfully advanced technological age, there’s always the option of a drone. Although they have small sensors, the 20 megapixel versions, in good light, will produce usable image quality. Another simple way around vertical convergence is to use foreground interest to balance the composition and use this as a means of keeping the sensor plane of the camera perpendicular to the building. Not only does this solve a problem but also provides a nice leading line for the eye to travel along to the main subject. If neither of these solutions is practicable then its time to rely on PhotoShop. It’s of paramount importance to shoot ‘loose’ if you're going to deploy this solution. By loose I mean leave plenty of room for what can be some pretty drastic post-correction cropping. You can often gauge how much of the frame will be cropped by using the in-camera perspective correction on a test Jpeg. This correction method does all sorts of terrible things to the pixels in your photo, and for some, this is a deal breaker. Personally, I've used this type of perspective correction quite a bit and at 100% the images look absolutely fine to me. It's always worth reminding yourself before you disappear down the technical rabbit hole that most viewers/clients won’t examine images the way you will. 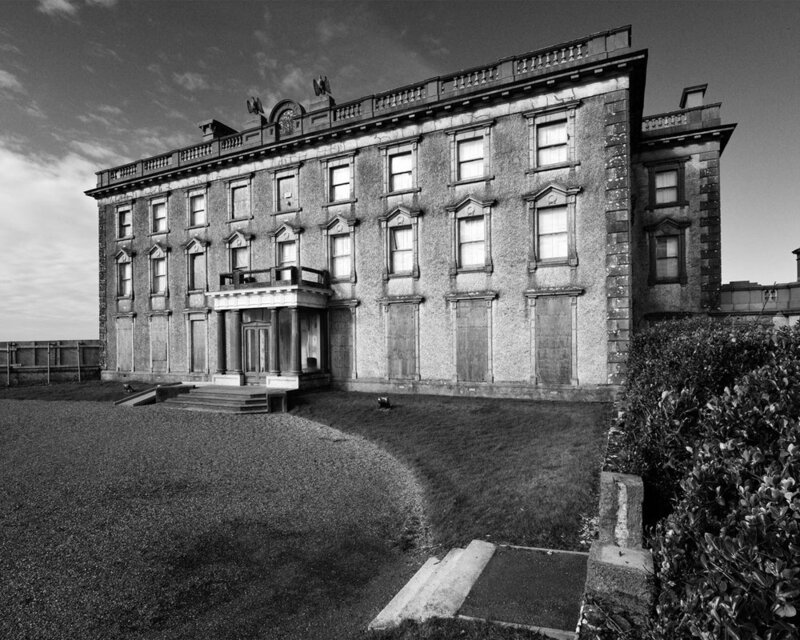 A big problem that you can encounter when you use PS in this way is that the building if you've applied a lot of correction, can look a bit ‘squashed’. If this happens you know you've probably pushed the envelope too far. You can, of course, hit up the ‘free transform’ tool and put another correction in, but you'll need a reference photo to make sure you de-squash the building by the right amount or know the building well enough to do it by eye. I would suggest that if you've gone this far the image is probably best suited to web use and smaller print sizes. Having said that I’m sure someone out there will prove me wrong! The final sanction is to go crazy and use the convergence creatively. These images tend to be very dramatic and can be a nice rest from an otherwise rigidly ‘correct’ set of photographs. 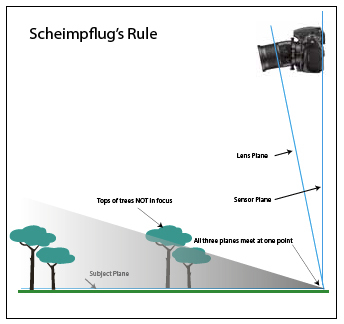 The main purpose of lens tilt is to increase depth of field by utilising the Scheimpflug principle. With standard and short tele tilt/shift lenses, these movements can prove essential to ensure sufficient depth of field, particularly when shooting close-ups such as product photographs. With wide angle lenses used to photograph large objects at reasonable distances or landscapes, the benefits are less obvious. A modern digital camera with a ‘full frame’ 36mm x 24mm sensor is still a relatively small format and it’s rare to run into problems with Depth of Field once you hit f8 or so using hyperfocal distance. A major advantage of tilts that are seldom mentioned with wide angle lenses is the exaggeration of perspective. Front tilt increases DoF but a rear tilt will make objects closer to the lens stretch into the mid-ground very nicely. This is a compositional tool which can be used to lead a viewer into the photograph. I haven't tried this because I don’t own one of these lenses myself, but common sense tells me that if you keep the front lens elements more perpendicular to the subject plane and then tilt the camera as you would the rear standard on a view camera, you should be able to create this optical effect, which will of course, wow your audience. It is of course perfectly feasible to use tilts in the horizontal image plane to extend DoF for vertical objects (walls or Artwork for example) as well. 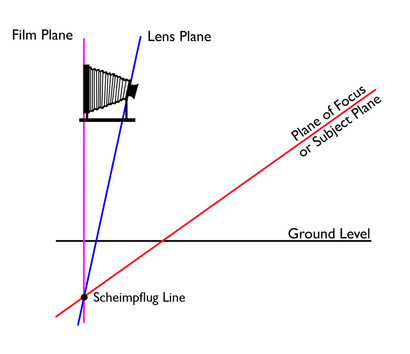 Most shift lenses allow shifts on all image planes. This for architecture can be incredibly useful. A technique I've used several times in the past is to use ‘cross front’ to avoid having my reflection appear in a mirror. On some occasions, it’s impossible to re-frame or move when confronted with, what for the photog is a badly placed mirror. By shifting the lens on the horizontal plane and moving yourself and the tripod laterally away from the mirror you can shoot straight into it, quite brilliantly you and your camera are now not in the reflection. This can lead often to clients thinking you’re a vampire. It is possible to have a quiet afternoon with the clone tool/cut paste in PhotoShop but I think it’s a far better use of time to deal with the issue at the taking stage.